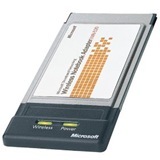 The Microsoft Wireless Notebook Adapter makes it easy to securely add a notebook computer (or any computer with a PC Card) to the 802.11b wireless network in your home or small office and share a broadband connection, such as a cable or DSL modem. The Microsoft Wireless Notebook Adapter protects your network from unauthorized access with 128-bit wireless security (WEP). It also includes the Microsoft Broadband Network Utility allowing you to easily monitor your network status.